Stephanie Wood Franklin is a reader, writer, gamer, and crafter, among other things. 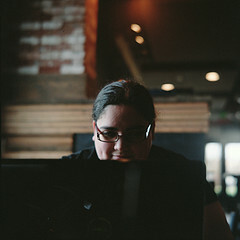 You can find bits of writing advice, essays, and pictures of her cats at her blog insertscenehere.blogspot.com or on Tumblr https://www.tumblr.com/blog/setauuta. Pif Magazine‘s Liz Kellebrew caught up with Franklin to talk about her creative process and her work as a board game beta tester. How did you become a board game beta tester? My husband and I have gotten to know several game designers and publishers over the years, as we’ve gone to several conventions as demonstrators. Through those publishers, we’ve been able to get early copies of games to test before they go into production. What do you look for when you’re testing a game? A big piece is clarity in the rules — do they make sense? Do they answer the basic questions of how to play? Also, making sure the board and components make sense and don’t contradict each other. Finally, of course, is it any fun to play? What makes a board game stand out from the rest? This is all based on what I personally enjoy — every gamer is different. I enjoy games with a lot of player interaction — it’s not much fun for me to just be doing my thing without having anything thrown at me from another player. I also like a little bit of randomness — I don’t like games where there’s one set strategy to win, because then there’s no point in playing it again. With a little bit of randomness, though, there’s a chance that your cunning plans can fall apart, and there’s something exciting and frustrating about that that I enjoy. You’re also a writer. How would you categorize your work? I tend toward the fantasy side of things, though some things turn toward horror on their own. I don’t know that I ever “decided” — I’ve always been a person of the book, and when I was very small, I realized that there were people who actually created the books I loved so much. It just seemed so cool, and like something I wanted to do as well. Seanan McGuire and Mira Grant come to mind, just because she’s so good at creating characters that the reader cares about (and then doing horrible things to them). Terry Pratchett has some fantastic world building and a sense of humor that I aspire to. Just get it written, and fix it in post. Is there a connection between your love of a good story and your love of games? It comes down to that idea of it not being much fun if there’s one ‘winning’ strategy. If there’s one plan that will get a character to their goal with no obstacles, there’s no real point in reading or writing it. Throwing in some randomness and finding ways to allow outside influences to screw with your (or your character’s) cunning plans always makes things more interesting and increases the stakes. What advice would you give to a budding board game designer? Design something you want to play — there’s an audience for every kind of game out there. Also, have a few people read your rules with a fresh set of eyes, and be open to their feedback and their questions. The world is pretty scary right now, and that’s when stories matter the most. Take strength from the stories that show you what’s possible, either reading or writing them.